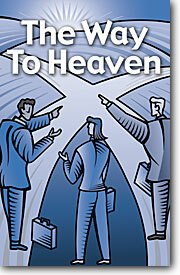 The only map to Heaven, the Bible, clearly presents only one way to Heaven. Jesus says, "I am the way, the truth, and the life. No one comes to the Father except through Me" (John 14:6). "There is a way that seems right to a man, but its end is the way of death" (Proverbs 14:12). Another divinely-inspired writer asks, "Has not God made foolish the wisdom of this world?" (1 Corinthians 1:20). "Not of works, lest anyone should boast" (Ephesians 2:9). The Word of God, on the contrary, presents Christ, and Christ alone, as The Way for ruined, helpless man to enter into Heaven. It is not that He is a way, as though there were other ways. Nor is it that He and something else or someone else with Him is the way. Jesus is the "one Mediator between God and men" (1 Timothy 2:5). "Christ also suffered once for sins, the just for the unjust, that He might bring us to God" (1 Peter 3:18). The pouring out of His precious blood at Calvary atoned for sin and paved the way for guilty man to draw nigh to God: cleansed, forgiven, and made fit for His holy presence. This Way is still open, dear reader. The living Savior who has already entered into the Father's house longs that you should be with Him in that place of eternal glory. You need to do nothing more than acknowledge your sin to Him and confess Him as the One who died for you and rose again. This is coming to Christ. This is salvation by grace through faith. "the one who comes to Me I will by no means cast out" (John 6:37).